Compare discounts for Hotels Motels Resorts in St. Petersburg, Florida! St. Petersburg is the 4th largest city in Florida and together with nearby Tampa surrounds Tampa Bay with a mix of modern buildings and traditional Floridian beach communities. Considered one of the more 'cultural' places in Florida, St. Petersburg is home to several museums and has a rejuvenated downtown area. With 234 miles of shoreline on Tampa Bay, Boca Ciega Bay and the Gulf of Mexico Intracoastal Waterway, the St. Petersburg area has some of the best beaches in Florida including the renowned Treasure Island and St. Pete Beach. Note: Lists are not identical. Different sites offer different accommodation options for St. Petersburg. The Don CeSar Beach Resort and Spa has a magnificent location. This beach front resort is located on the island of St. Pete Beach, on the Gulf of Mexico. The sister property of The Don CeSar Beach Resort and Spa, the Beach House Suites by The Don CeSar, is an all-suite, 70-room luxury resort. Just a short, sandy stroll from The Don, the Beach House Suites compliments the elaborate amenities and special pampering of Florida's legendary Pink Palace. Combining the grace, style, and sophistication of old Florida elegance with the relaxing resort experience, the Sirata Beach Resort and Conference Center is tailored for whatever your tropical tastes desire. Tropical gardens and a private beach on the Gulf await you. Five and a half acres of landscaped privacy and the pristine waters of Mexico's sunny shores make for an unforgettable backdrop. The Travelodge Hotel St. Pete. Beach provides lodging directly on 500 feet of white sandy beaches on the Gulf of Mexico. At the center of St. Petersburg, the Hilton St. Petersburg has a magnificent vantage point offering guests spectacular views from their guest rooms. The Resort is the most complete gulf-front hotel on Florida's central west coast. The 577 guest rooms and suites are located in four buildings, with many of the accommodations having exterior balconies with views of the Gulf beach, the meandering resort waterway, or lush courtyard areas. Categories of standard, deluxe, and luxury generally relate to the view of the room. Up to 49 two and three bedroom suite combinations are available upon request. Seven penthouses provide excellent venues for larger families or group hospitality functions with magnificent views. The showplace of St. Petersburg's scenic waterfront, the 360-room Renaissance resort recalls the style and glamour of another era. 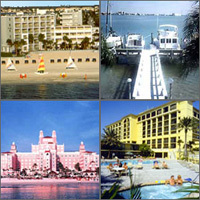 The Alden Beach Resort located directly on the Gulf of Mexico in beautiful St. Pete Beach, Florida. The charming warmth and character of the Heritage Holiday Inn captures the romantic style and sophistication of yesteryear, while offering a rich array of modern day comforts and conveniences. The newly renovated Days Inn of St. Petersburg has king and double beds for the comfort of guests. The hotel offers free 25 channels including HBO, CNN and ESPN in every room, refrigerator and microwaves upon request. The Sandpiper Beach Resort is located on St.Pete Beach which is a gulf coast barrier island 7 miles long and a quarter of a mile wide. The beachfront location offers many diverse recreational opportunities. Located directly on the beach and Gulf of Mexico, award winning landscaping with beautiful palm trees. The West Coast's only and highest revolving rooftop lounge resort with the most spectacular view above the beach and island. Whether you're traveling for business or pleasure, LaQuinta hotels offer a warm and inviting atmosphere with consistent, affordable quality. Hampton Inn is the nation's leading chain of quality, value-priced hotels. Here you'll find clean, fresh, comfortable rooms standard with a coffee maker, iron and ironing board, data port, and free in-room movie channel (HBO).